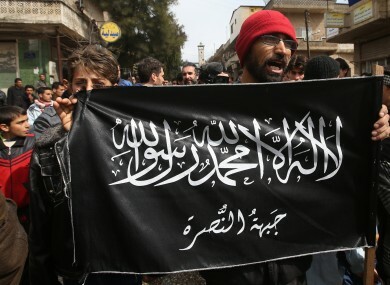 A man holds the flag of the Al-Nusra Front which is thought to have kidnapped the woman. A GERMAN WOMAN who was kidnapped in Syria last year while she was pregnant has been freed along with her baby, the German foreign ministry has said. The pair were released yesterday and had safely crossed the border into Turkey, a ministry spokeswoman said, declining to name the woman. “The German national and her child who was born in captivity are doing well under the circumstances,” she said, adding that they were now safely in the care of consular officers and German police. The German embassy in Ankara was preparing their journey home. The German government is “relieved about the positive outcome of this case given the extraordinarily difficult situation in Syria,” the spokeswoman said yesterday. The ministry gave no further details. German media have identified the woman as a freelance journalist who travelled to Syria on the promise of getting exclusive information. Focus magazine reported earlier this year that the 27-year-old had gone missing in October 2015, apparently kidnapped by militants from the Al-Qaeda-affiliated Al-Nusra Front who were demanding a €5 million ransom. The weekly said she gave birth in December. But members of the jihadist group, which is now known as Fateh al-Sham, said in a statement yesterday that they had nothing to do with the kidnapping and had in fact been the ones to free the woman and her baby, according to the SITE intelligence group. The German government says it does not pay ransom demands for hostages. The foreign ministry spokeswoman said German officials had made “considerable efforts to resolve the case”. Meanwhile, US Secretary of State John Kerry warned today that Washington is on the brink of ending its talks with Russia on the Syrian conflict over the assault on Aleppo. “I think we are on the verge of suspending the discussion because, you know, it’s irrational in the context of the kind of bombing taking place, to be sitting there, trying to take things seriously,” Kerry said. Yesterday, Kerry called his Russian counterpart Sergei Lavrov to warn that he would end talks unless Moscow halts the assault on Aleppo and forces Bashar al-Assad to ground the Syrian air force. Kerry’s spokesman John Kirby told reporters Kerry had again called Lavrov today “and continued their conversation” but apparently without making a breakthrough. Kerry said the United States would pursue other alternatives, “barring some clear indication by the warring parties that they are prepared to consider how to approach this more effectively”. And White House spokesman Josh Earnest said President Barack Obama was “very distressed” by reports from Syria and had asked his team to “look for and evaluate additional options that we can undertake to try to reduce the violence”. Meanwhile, Kremlin spokesman Dmitry Peskov said Moscow would press on with its bombing campaign in Syria, where Assad’s forces are waging a furious assault on Aleppo’s rebel-held eastern sector. A top UN aid official called the situation in Aleppo a “merciless abyss of humanitarian catastrophe,” in the latest appeal for a halt to fighting. Kerry’s efforts to broker a ceasefire have come under fire from Republicans who have called for tougher action against Moscow and the Syrian regime. “It’s easy to be critical of diplomatic efforts because it’s difficult, but what is the alternative?” said Kerry. He said the United States would defeat the Islamic State militants operating in Syria and Iraq, “but that is different and distinct from involving ourselves directly into the civil war which is the war against Assad”. His comments echoed those of Obama who insisted yesterday that “there is not a scenario in which, absent us deploying large numbers of troops, we can stop a civil war in which both sides are deeply dug in”. Email “German woman kidnapped in Syria while pregnant has been released with her baby ”. Feedback on “German woman kidnapped in Syria while pregnant has been released with her baby ”.